Greg & Jeanne Carter live in Novato, California. 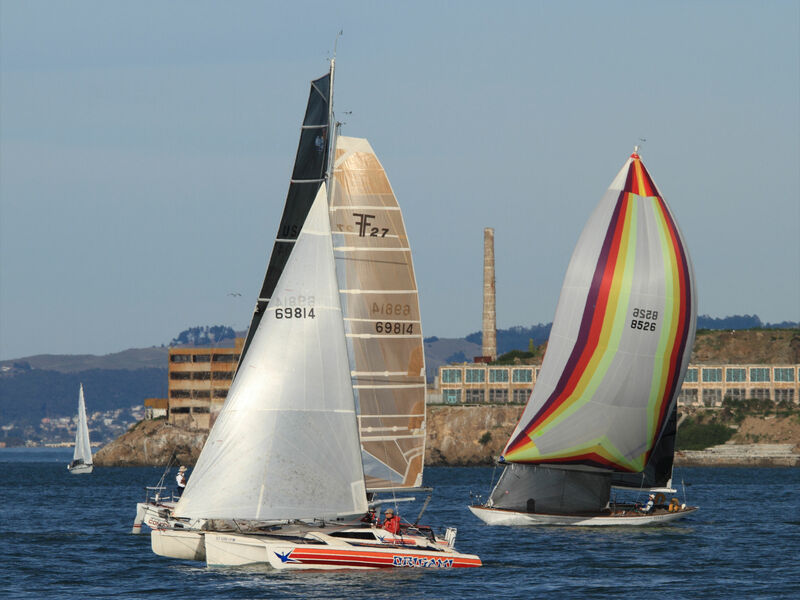 We owned F27 #217 (sail number 69814 – yes, Aug 14 ’69 was the first day of Woodstock) for 5 years ’08-’12, after crewing for her previous (and once again current) owner Jim. Fantastic sailing aboard Origami since the late ’90’s are directly to blame for the F36 plunge. The building project was done in a 1,000 sq ft workshop at a light-industry park about a mile from our prior home. Currently building a shuttleworth 37( up dated 35).. Spent 12 years building a 65 foot tri which I sold some time ago. My son lives in Petaluma and would like to see your project next time I’m down if possible? I am planning on being in Petaluma the week prior to 4th of July. I am working on getting the new project online to share but have not had time. At 63 feet it was possible but not easy to single hand, but in Puget sound we could do just fine with 2 crew. The problems was if something when wrong which luckily was seldom. Greg: we talked earlier about me visiting your build site. I’m down in Petaluma until the 6 th. When would be convenient for you? Hi. Tomorrow is good, or Mon thru Thurs mornings. Hi Greg, I saw that you used latex paint on the interior surfaces and was wondering how it worked out for you, it is something that I would be interested in for my build. John, I’m very happy with the acrylic latex interior for ease of use, low cost and personal safety. The marine topsides paint fumes in an enclosed space are very dangerous and difficult to work with. But I used an eggshell finish and it is too matte/flat for areas that will get kicked or scuffed. I will likely redo with a semi gloss, and would suggest you try semi gloss first. Would you be willing to come speak to our group about your building experiences? We’re a local chapter of the Experimental Aircraft Association, and many of us have similar experience in building airplanes using composite materials, with similar challenges (we’ve all faced the issue of surviving the painting process!) I think would be interesting and even instructive for our group to see how you’ve approached your project, which seems from the outside very similar in scope and nature to building a plane. Would you be interested in coming all the way down to Novato on a Tuesday night sometime to share your experience? Great to see you pop up here Ken! Yea that sounds like fun. The year before I started at Rachel’s office I was inspired at the hanger of my boss’ RV8 build-in-progress; that was a notch in the confidence about taking this project on. It’ll be good to compare. How many people come to your meetings? I’m thinking we do this a few months out when the boat is in the water, i.e. Ask the group to come see it first and then we go sit and talk.